♫ ♫ FROSTY THE SNOWMAN . 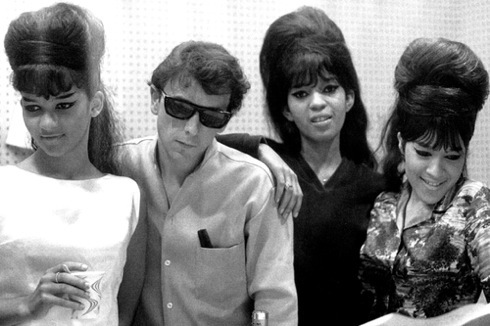 . .
➢ WHILE WE’RE WITH THE RONETTES, WHAT’S THE SMASH THAT CHANGED THE SOUND OF 60s POP? ❚ BRIAN WILSON OF THE BEACH BOYS has declared Be My Baby by the Ronettes his own all-time favourite, and the greatest pop record ever: “The choruses blew me away.” Whoa-oh-oh-oh-ohhh! In August 1963 it changed the game entirely. Be My Baby swept into the charts with a lush new approach to orchestration called the “Wall of Sound” that was to bring down a cleaver between rock and pop. Both however were infected by the sheer musicality introduced by its creator, the record producer Phil Spector. He layered pianos, guitars, reeds, brass and most daringly strings, adding studio overdubs and echo, plus any number of people on percussion — famously, castanets. His own description was “little symphonies for the kids”. Be My Baby took 42 takes to complete, and its spine-tingling intro is unbeatable. The Ronettes’ original has been immortalised in the Grammy Hall of Fame and the Library of Congress for being the quintessence of the dense Spector sound that influenced all who followed, including The Beatles on Let It Be, and the output of Trevor Horn in the 1980s. The song was co-written by one of the many writing partnerships based in New York’s Brill Building — Ellie Greenwich and Jeff Barry — with a few finishing flourishes added by Spector. The Ronettes themselves were three hot girls from Spanish Harlem, the sisters Estelle and Ronnie Bennett (who later married Spector), and their cousin, Nedra Talley. Their trademarks were beehive hair-dos, eye makeup in the Cleopatra style and tight skirts. 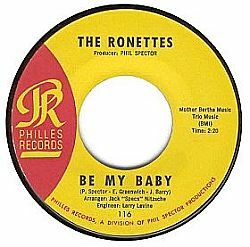 Spector signed the Ronettes to his Philles record label and subsequently managed them. Other smash hits included Baby I Love You, The Best Part of Breaking Up, and Walking In the Rain with Spector’s classic storm effects (covered memorably by the Walker Brothers in 1967). This entry was posted in Pop music and tagged 2011, Phil Spector, Philles, Ronettes, Tipping points, Video, Wall of sound. Bookmark the permalink.